FA: Greg Barnes, Joe Denicola, Linda Jarit, September 2008. 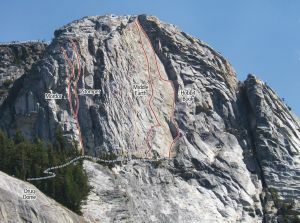 A new route that climbs through the huge roofs on the left side of Mariuolumne Dome, Mordor is a wild, steep crack climb with outrageous exposure. As with its neighbor Stomper, Mordor has an alpine feel in sections and climbers should watch out for a few loose blocks throughout the climb, particularly on the easy 5th top out pitches. The first pitch is shared with Stomper and has multiple variations: a 5.6 offwidth on the left, a 5.8 dihedral with a small roof just to the right, or the main corner which starts with a bouldery 5.9 section up hollow blocks. Regardless of which start you use, beware of loose blocks. The second pitch heads up the classic hand crack dihedral left of the 5.9 fist/offwith corner of Stomper, and ends at the same set of large belay ledges as that route. You can easily mix and match the second pitches of the two routes. The third pitch is the roof. Starting with a short, hard stemming dihedral, then traversing left on face past a bolt to an offwidth corner (a 6” cam is nice here), the crux is the first section of the roof, with powerful underclinging to gain good footholds. At the end of the roof, layback and jam past a small second roof/block to a hand rail (5” crack, but with hidden 2” pro), then traverse right under the next roof with awkward handjams, good footholds, and stomach-churning exposure. Set the belay at the end of the second roof, standing on a 6” wide ledge, about 10 feet above the lip of the main roof. It’s very easy to dangle a loop of the lead rope down to the second belay to haul anything the follower doesn’t want to carry. The fourth pitch climbs the golden hand crack past some bulges to a steep offwidth which you climb around using knobs to the right. It’s easiest to do a ridiculously exposed step sharply to the right to a lieback flake, then climb back left above the top of the offwidth. The climbing eases dramatically at this point, and various belays are possible. Low 5th class climbing for another pitch (watch for loose blocks) leads to 4th class to the top. With some sharp edges and steep overhangs, a thick lead line or double ropes are recommended. It’s possible for the follower to fall out of the roof, with the rope sawing on edges as they swing in space. To prevent this, it’s important for the leader to protect the end of the first part of the roof. Which SuperTopo guidebooks include a topo for Mordor?